The VTech DM251-102 Digital Audio Monitor with DECT 6.0 digital technology provides crystal clear transmission, eliminating the annoying background noise. It has backlit display on the parent unit, 5-level sound indicator and is expandable up to 20 sensors. The audio monitor has a Open/closed sensor which provides visual and voice alerts to notify when something opens. The VTech DM251-102 has many exciting features for users of all types. You can extend the lifetime of your VTech DM251-102 with the purchase of a FactoryOutletStore Factory Protection Plan. 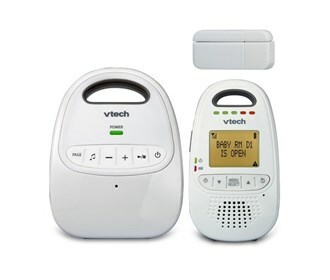 See the VTech DM251-102 gallery images above for more product views. The VTech DM251-102 is sold as a Brand New Unopened Item.